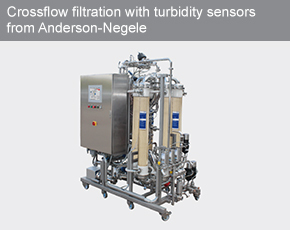 To increase the efficiency of crossflow filtration, MAHLE InnoWa GmbH relies on turbidity sensors from Anderson-Negele for automatic filter monitoring. MAHLE InnoWa develops and produces wine and fruit juice filtration systems that meet high quality and reliability requirements. The crossflow filtration method, which is also known as tangential flow filtration, is used to filter liquids such as those used in the food industry, for example by wine and fruit juice producers. The advantage of this filtration method is that the tangential flow across the filter medium delays the formation of a filter cake. 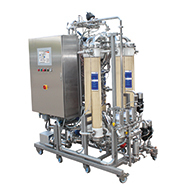 The crossflow filtration system in the microfiltration range is used to remove trub, colloidal solids and yeasts. It can be employed in various stages of wine preparation – for example in the cellar filtration during maturation or in the filtration prior to bottling. In crossflow filtration with hollow fibers, the suspension being filtered is pumped into the interior of the hollow fibers and a portion of it is drawn off via the sleeve surface of the hollow fiber membrane in a direction perpendicular to the flow. The rest circulates as a concentrate and is returned to the hollow fiber module, until it likewise leaves the system as filtrate. The resulting filtrate is clear and free of solids. Microbiological stability is achieved at this point. Normally, reliable separation of the filtrate and concentrate is ensured by the design of the crossflow filtration system and hollow fiber membrane. However, membrane damage caused by external influences such as material fatigue can never be ruled out entirely. If yeast from the concentrate recontaminates the filtrate due to a tear in the fibers, for example, fermentation would continue in the final product. Hence, the purity of the filtrate needs to be monitored throughout the filtering process. Until now, the filtrate was monitored through a viewing glass at the filter outlet. However, this method required the system operator to invest considerable time and effort in regularly checking the filtrate on location. If a filter breakage was not detected immediately, the complete batch had to be refiltered. This led to additional energy costs and a considerable loss in time depending on the batch size. In addition, process-controlled filter monitoring using turbidity measurement is consistently reliable. The ITM-4 turbidity sensor, which is installed directly at the filter outlet, detects very low turbidity levels precisely and promptly. This reliably reduces the risk of contamination of the final product. The 4-beam alternating light technology used by Anderson-Negele compensates for any contamination of the optics and ensures that the sensor operates reliably on a continuous basis. In addition, the automated solution significantly increases production efficiency. 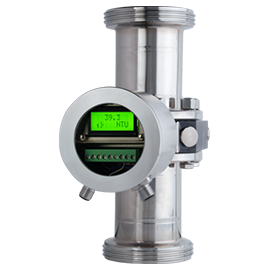 While manual monitoring requires the system operator to be present on location, the turbidity sensor allows the operator to perform other tasks in parallel. If turbidity is detected, the responsible technician immediately receives a message on their cell phone or iPad. MAHLE InnoWa develops and produces systems that meet stringent requirements for efficiency, reliability and longevity, and therefore relies on sensors from Anderson-Negele. The decision to use the ITM-4 turbidity sensor from AndersonNegele was made not least because of the application expertise and professional consulting provided by the sensor specialist.